Get a glimpse of the beautiful park and learn a little about Mildred. 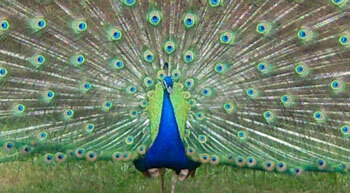 Please feel free to share as this is a great way to 'advertise' our wonderful park! The Park is open year-round for hikers and the campground is closed for the winter. Reservations can be made at Douglas County Website. Follow the Friends of Mildred Kanipe Memorial Park facebook page, then 'like' us and you'll know about all the fun happening at your beautiful park where you can camp, picnic, ride horses, hike, watch birds, see native wildflowers and experience Mildred's love of her land. The mission of this organization shall be to provide volunteer services for the purpose of restoring, improving, maintaining and protecting the natural resources of the park such as land, plants and animals, the historic structures present in the park and other park improvements such as fences, restrooms, picnic areas, etc. for the purpose of providing recreational, educational and cultural experiences for the public, in accordance with the conditions of Mildred Kanipe’s Will and to raise funds to cover as much as possible of the related costs. In 1983, Mildred Kanipe, a colorful farmer passed away, and left her beloved ranch to the public as a county park. 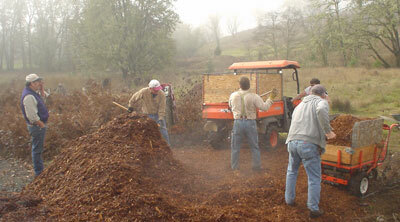 Mildred’s gift included almost 1,100 acres of land consisting of pastures, creeks, rolling hills, orchards and forests. Historical structures include a turn-of-the-century schoolhouse, a farmhouse, and outbuildings. She wished the buildings to be preserved, a ranch museum developed, equestrian trails to be available and the land was to remain an animal refuge, the land and plants preserved. In 2005, due to the financial burden, the Douglas County Commissioners were considering returning the park to the Mildred Kanipe Trust. People organized to help the park remain in the public domain and open to the people, and, The Friends of Mildred Kanipe Memorial Park Association, Inc. (501 c 3, nonprofit tax exempt) was created. We are committed to keep the park as public land for the enjoyment of visiters. 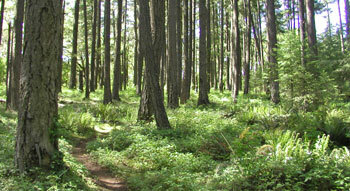 Extensive trails pass thru majestic forests, oak woodlands, lush pastures, over creeks and offers spectacular views. The trails are open to horses March 16th through October 31st, and year-round for hikers. A pavilion next to equestrian parking offers a place to sit, eat or chat. Mildred’s home, sheep barn, horse barn and buggy shed still stand. Due to lack of monies, sorely needed renovations have not occurred, but the structures are just as interesting in their deteriorating condition. Some of Mildred’s old farm machinery is on display. Mildred is buried next to her home. A picnic area under shady trees is enjoyed in the Farmstead area. Colorful peacocks cry out among the trees. A relaxing and enjoyable nature trail has been designed and constructed by Friends of the Umpqua Hiking Club and the Douglas Soil & Water Conservation District. Native plants, many provided by Native Plant Society, are being planted. The old schoolhouse has received new foundation, paint, windows and a new roof. Next is refurbishing interior. Educational events are planned for the future. Special events, such as organized equestrian rides, weddings, family reunions and festivities occur regularly. The land is leased for cattle which roam most of the acres in the park. This lease is a major source of income for the park. The Friends provide volunteer services to restore, improve, maintain, and protect the land, plants and animals, and historic structures. We raise funds to help Douglas County with the park's expenses. We advocate for heightened community awareness and appreciation for the unique nature of the park's lands and structures. We are supported by those who cherish Mildred’s land. Join The Friends or get involved and see how you can contribute to the park or become a volunteer. 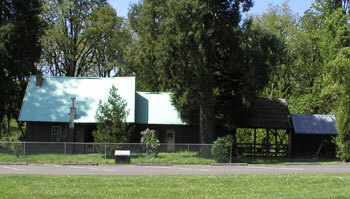 Mildred Kanipe Memorial Park is located 8 miles northeast of Oakland, Oregon at 16513 Elkhead Road. Click here for map.